This fabulous India Safari goes in search of snow leopards in the Himalayas, tigers in Pench National Park & sloth bears in Satpura. In Hemis National Park you will search on foot for snow leopard & other elusive alpine wildlife such as the Tibetan wolf & Himalayan fox. In Pench enjoy jeep safaris & in Satpura track wildlife on foot, by canoe & jeep, including night drives. All park fees, game drives & transfers included. This morning you will be met at Delhi Airport by your driver and transferred to your hotel in this ancient capital of kingdoms and empires that is now a sprawling metropolis. After checking into your hotel, enjoy an orientation tour of the 17th century walled city of Old Delhi including driving past the splendid Red Fort, once the most opulent palace in the Mughal Empire and the Jamia Masjid, the largest mosque in India. Also enjoy a chaotic rickshaw ride through Chandani Chowk - one of the busiest markets in Old Delhi. We then visit the Raj Ghat, the memorial site where Mahatma Gandhi was cremated, before continuing to the magnificent Swaminarayan Akshardham Temple that showcases 10,000 years of Indian culture in breathtaking grandeur, including a short boat ride. Note: Both the Red Fort and the Temple are closed Mondays, when alternative sightseeing is offered. This morning transfer to Delhi Airport for your flight to the high-desert town of Leh in the district of Ladakh in the northern Indian state of Jammu and Kashmir. Check into your hotel in this town that was originally a stopping point for trading caravans, but is now known for its beautiful Buddhist monasteries, picturesque trekking and interesting markets. Spend the rest of the day acclimatising to the high altitude in the spectacular Himalayas (11,500 ft / 3,500 m). Today is free to continue acclimatising to the high altutude of the Himalayas Mountains. If you feel comfortable enough, this evening you can visit the Shanti Stupa and the city market. Alternatively you can do some birding around the Indus River. This morning we drive 40-minutes to Jonchen, from where we begin trekking to the village of Rumbak. Rumbak lies in the heart of Hemis National Park and will be our base for exploring different valleys and ridges in search of the wildlife of this region. Note: Although a homestay will be more comfortable, there is also the option of sleeping in tents at a nearby campsite, which gives the flexibility of being able to move up into the mountains if there are not many animals near Rumbak. Today is devoted to searching for wildlife on foot in Hemis National Park. 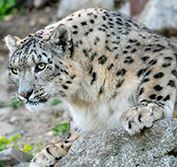 With the highest density of Snow Leopards in the world, this is the largest national park in India and the only one situated north of the Himalayas. Other animals you can hope to see here including the Tibetan wolf, Himalayan fox, Argali (great Tibetan sheep), Bharal (blue sheep), Ibex, Eurasian brown bear, Red fox and the elusive Eurasian lynx. Small mammals include the Himalayan marmot, mountain weasel and Himalayan mouse hare. The Rumbak Valley also offers opportunities for birdwatching, with 73 recorded species including several Tibetan species not common in other parts of India. Birds present here include the Brown accentor, Robin accentor, Tickell's leaf warbler, Streaked rosefinch, Black-winged snowfinch, Chukar, Blyth's swift, Red-billed chough, Himalayan snowcock and the Fire-fronted serin. You can also see birds of prey such as the Golden eagle, Lammergeier vulture and Himalayan griffon vulture. Note: Please be aware that this activity occurs at very high altitude, so do not exert yourself and walk slowly. This morning enjoy a last hike into the Himalayan wilderness of Hemis National Park. Afterwards we leave Rumbak and head back to our hotel in the ancient town of Leh. Transfer to Leh Airport for your flight to Delhi. You will be met at Delhi Airport and transferred to your hotel in this capital city. Transfer to Delhi Airport for your flight to Nagpur. You will be met at Nagpur Airport and transferred 3.5-hours to Pench National Park, situated in the lower reaches of the Satpura Hills. Check into your lodge in this beautiful tiger reserve that is rich in diversity and supports an abundance of flora, fauna and aquatic life. In the afternoon enjoy a jeep safari in this delightful wildlife reserve. This morning enjoy a shared game drive in beautiful Pench National Park that inspired Rudyard Kipling to write his famous childrens story - The Jungle Book - featuring Mowgli the man cub, Shere Kahn the tiger, Baloo the sloth bear, Kaa the snake and King Louis the amusing ape. Tiger sightings are good in this small reserve which is divided by the Pench River, but are never guaranteed. You may also see chital, sambhar, nilgai, wild boar, jackal and barking deer. Jungle cats and leopards are also present but rarely seen. There are also over 170 different species of birds. Today leave Pench and transfer 4-hours to Satpura National Park. Named after the Satpura Range, this rugged reserve with its sandstone peaks, narrow gorges, ravines and dense forests preserves over 850 square miles (2,200 sq.km) of the central Indian highlands eco-system - together with the adjoining Bori and Pachmarhi wildlife sanctuaries. With an altitude ranging from the level plains of Churna (984 ft / 300 m) to the Dhoopgarh Peak (4,430 ft / 1,350 m), this park sustains a wide diversity of birdlife, animals and plants. In the evening enjoy a shared Night Drive, searching for the nocturnal animals of this park by spotlight. This morning enjoy exploring the dense vegetation of Satpura National Park on foot with your guide, followed by a canoe ride down the Denwa River. In the afternoon venture further afield on a shared jeep safari. Satpura is very rich in biodiversity and in this sanctuary you can hope to see sambar, nilgai, chital, Indian muntjac, four-horned antelope, chinkara, wild boar, black buck, fox, porcupine, flying squirrel, mouse deer, Indian giant squirrel and the elusive leopard. Leopard and Sloth bear sightings in this park are particularly good, but tiger sightings are rare. This park is also home to a wide variety of butterflies and over 300 species of birds that live in these lowlands, wetlands and mountains. During the winter months many build their nests and roost here, making this a particularly rewarding time to visit. You can hope to see the Peacock, Grey hornbill, Malabar pied hornbill, Black shouldered kite, Treepie, Shikra and many more species. Today enjoy a full day shared jeep safari, taking the 20-mile (30 km) Churna Route deep into the forests of Satpura National Park. This morning enjoy another shared jeep safari in Satpura National Park. Afterwards transfer 3.5-hours to Bhopal Airport for your flight to Delhi, where you will be met and transferred to your airport hotel.